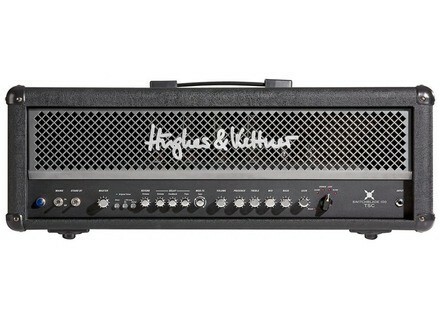 Switchblade 100 TSC Head, Tube Guitar Amp Head from Hughes & Kettner in the Switchblade series. According to the company, TSC technology makes it possible to automatically adjust bia, ensuring optimum idle curren, even in the event of a tube defect. TSC then switches off and indicates the faulty tube to you, but lets you continue playing the amp. A quick glance at the four small LEDs on the back of your Switchblade TSC supposedly tells you whether or not it’s working properly. The first product in the new line, the Switchblade TSC features all-tube 4 channel amps, described as "versatile" with tone ranging from "bright and clear" to "high gain". Effects include reverb, modulation and tap delay. Those digital effects supposedly don't affect the analog nature of the amp. The amp itself is said to be programmable, with 128 presets that can be saved in the included footswitch. Slated for a late April 09 release, the Switchblade TSC Series includes a 100W Head as well as 2 combo amps (2 x 12“ - 100 W) and 1 x 12“ - 50W). [Musikmesse] Bolt Amps 100W Head Bolt Amps from Utah presented its line of guitar tube amps at Musikmesse earlier this month. Manne Redwing Gloss Special More news from Manne Guitars,with its recent Redwing Gloss Special model.